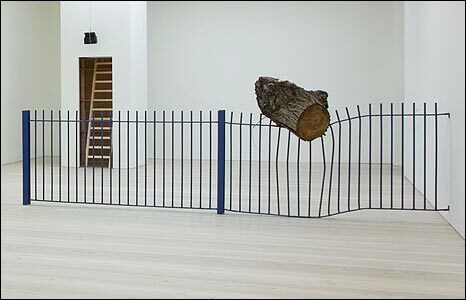 Artist Eugenie Scrase has won BBC Two's School of Saatchi show with her tree trunk impaled on a length of fence. The 20-year-old from Buckingham beat five finalists to win a place in art mogul Charles Saatchi's current show and studio space for three years. Matt Clark also caught the eye of Saatchi and has been asked to create work for his show next year. French-born Scrase called the outcome "mind-blowing" and thanked Saatchi for providing the opportunity. Her artwork, Trunkated Trunk, has been on show at the Hermitage in St Petersburg, Russia, since October, but has now been acknowledged as her piece. Scrase found the fallen tree while out walking in east London and asked the owner if she could remove the section of fence it was impaled on as well. She is currently studying sculpture at the Slade School of Fine Art. Artist Tracey Emin, who was on the panel which helped Saatchi pick the finalists and eventual winner, said Scrase had come up with "a genius idea". "Some artists could see that but they'd never have the confidence to go ahead and do it," she added. The six finalists were given the task of creating an exhibition for one night only at London's Saatchi Gallery, given just three weeks to organise the event and create their works. Saatchi, who is notoriously publicity shy, has not appeared on camera during the series.